A great cavern lies below the surface, ready for you to explore — this is where the storytelling comes in. When you send a group of villagers to explore the depths, one of your friends reads what happens to you from a book of paragraphs. You’ll be given a choice of how to react, and a lot will depend on which villagers you brought on the expedition, and who you’re willing to sacrifice to succeed. The book of paragraphs is packed with encounters of amazing adventure, randomly chosen each time you visit the cavern. There are a lot of games on the market these days where you’re bandying about ore, rope, whatnot to corner the market in your tabletop economy; however, if I wanted to micromanage a bunch of construction materials I’d go work at Home Depot, not play a board game. Board games are supposed to be fun! I want exciting adventures where I can meet new and interesting people, possibly because I need to kill them to save the world! Thankfully, Above and Below is here to split the difference between going on a grand adventure and trying to collect a bunch of jars. Much of the game is based around building a village, exploiting the proletariat to generate goods for you, seducing new workers to live in your town only to force them to become indebted to the company store, collecting fruit, and all that. You get points for your stuff and reputation after seven rounds, and whoever has more points is the winner. As with most Eurogames it’s like having a job, only you pay for the experience instead of the other way around. Above and Below feels like throwback to the Fighting Fantasy/Lone Wolf/Endless Quest gamebooks of yesteryear. The storytelling aspect of the game elevates the generic resource-collecting element, and makes every playthrough a unique journey into a delightful fantasy world. If I have to collect mushrooms, I like that I sometimes have choose whether to punch a scorpion to do it. 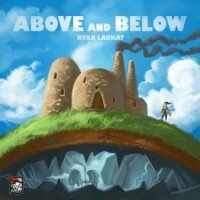 Above & Below is the first game in Ryan Laukat’s Arzium setting. This family also includes Islebound and Near & Far; I gather that there may be at least one more game coming (as of this writing), but I don’t know what it might be just yet. In Above and Below each player controls the actions of a number of refugees as they strive to build a new home in a strange land. The events detailing the loss of their former home are chronicled (lightly) in the rulebook, but happen before play begins. At the start of the game, each player (2-4) has three villagers each with their own skills which they will need to build a new village. The game played over a set number (7) of rounds in which each player takes as many actions as she can until there are no more villagers to activate. Play then passes to the next player. Once all players have performed as many actions in their turn as possible, the round ends, some book keeping is performed, and the next round begins. After 7 rounds, victory points are tallied and the winner is determined. Let’s start by looking at the villagers. Each of a player’s starting villagers will have some symbols on the top—a Hammer (he’s a Builder), a Quill (she’s a Trainer), and all villagers will have one (or more) d6s on them with a number (1-3) of small lanterns beneath them. Builders, well… build things, and Trainers train new villagers to grow your population. You start with one Builder with a Hammer and one die, one Trainer with a Quill and one die, and one non-specialized villager with two dice but no skill icon. Build: You can “exhaust” one villager with a Hammer in order to buy a building. Aside from needing a builder, you’ll need some gold to pay for the building. There are four areas on the table which you can buy buildings from. The House track is a row of four buildings which you can choose from; these represent the buildings Above ground. The Outpost track is a row of four buildings which you can choose from; these are the buildings Below ground (we’ll come back to that). NOTE: you can only build these buildings if you have explored the caves and have staked out a spot to do so (again, we’ll come back to that). The Star track is a row of six buildings which is that same in each game; these are high value buildings which will help you win the game. The Key track is a row of four buildings randomly selected from a set of nine possible buildings at the start of each game during set-up. The buildings all have perks which will help you in one way or another. Train: You can exhaust one villager with a Quill symbol to train a new villager to join your ranks. New villagers are selected from a row of five currently available villagers, each with a cost listed beneath them (ranging from 2 to 5 gold). New villagers join your population exhausted, so they can’t be used immediately. Harvest: You can exhaust as many of your villagers as you like in order to harvest any goods which your buildings produce or provide. This is an important distinction as some buildings provide a set number of a specified good (say Fruit), but once you have harvested it all, they produce no more. Other building produce goods on an on-going basis—once you harvest from it, it will refill with more at the end of the round. Goods are key to winning, so we’ll come back to them as well. Labor: Much like harvesting, you can exhaust as many of your villagers as you want and gain one gold piece for each one who labored. In addition, if you are the first player to have performed a labor action in the round, you will gain a coveted Cider token (useful during bookkeeping or to sell for gold). OK, so you’ve chosen some villagers to go underground. Did you choose the right ones? This is where those dice symbols on the villagers will come into play. Look at the villagers; each one has at least (a possibly two) dice symbols with some lanterns (aka exploration successes) beneath them. The value on the die face must be equaled or exceeded on 1d6 in order to score the indicated number of successes; so a die showing 5 with 2 lanterns beneath it means you need to roll a 5 or 6 in order to gain 2 successes. Why do I need successes? 31. Your party reaches a camp in a sandy-floored cave. A lone man with a short beard sits near a fire, roasting what looks like a rodent of some kind on a stick. ‘Got anything to trade?’ he asks. Do you sit and haggle or keep exploring? The first part sets the scene for you. The next parts offer you possible choices (Keep Exploring vs Trade) as well as how many successes you’ll need to accomplish the various choices (3, 3 or 6). All of these things are read to you; what isn’t read to you are the rewards. Rewards can be various items—Coins, Goods, etc…—sometimes, it can point you on to another paragraph (for a longer adventure), or, it could even lead you to find a unique special villager (such as the Metal Man). Now, you choose you option—say, Trade with the Man—and roll 1d6 for each villager on the adventure. You compare your die rolls to the symbols on their tokens and see how many successes you got. If you got a number equal to or greater than one of the success options, you get the reward. In the above example, if you chose to Trade, and you got 4 successes you could pay the man one coin and gain the reward for 3 successes. If you got 6 successes and pay him one coin you would get the reward listed for that level of success (not both rewards for 3 and 6, just the reward for getting 6). Now, if you didn’t get successes to get a reward (say you only got 2) you may choose to injure a village for an additional success. For each villager you choose to injure, you’ll get an additional success, but it will take them longer (potentially) to recover and be ready to perform actions of future turns, so choose wisely. But wait! That’s not all… IF you succeeded at your adventure you also have scouted out a place Below ground where you can build an Outpost. Outposts are much like the buildings you build above ground—you need a builder to build one, you choose it from the current list of four available Outposts, they take Coins to build, and they give you some sort of bonus/perk for having built them. Unlike Above ground buildings which you can pretty much just build willy-nilly, you have to have a cave card (which you get by succeeding at an adventure) to build an Outpost on. However, many of the Goods which are available in the game—Amethyst, Fish, Mushrooms, and Ore—are ONLY available from Outposts (we’ll come back to why you want goods soon). The other reward you can gain from Exploring is Reputation. At the end of the game, the player with the highest reputation will gain additional victory (Village) points; have a very high (or very low) reputation can also gain (or cost) you victory points. Now, Goods; each player has a Player Board where he keeps track of his Villagers, Coins, and Goods. Goods can be placed in various places on/around the board; placed up for sale to other players, held aside for use later, or they can be committed to your Advancement Track (at the bottom of your Player Board). The Advancement Track has a number of spaces on it for goods to be placed. Each space can only hold one type of Good, and once chosen, can only hold that specific Good for the rest of the game (choose wisely). Placing Goods on the track does two things: 1) increases you Income (aka the number of Coins you will get at the end of each round. Income starts at 4, and then goes up from there). It also gains you victory points at the end of the game. Each space on the track will have a victory point amount associated with it (ranging from 1 to x); at game’s end, you’ll gain a number of victory points equal to that number times the total number of Goods in that space (so if I have 5 pieces of Rope on a space worth 2 VP, I’ll get 10 VP at game’s end). OK, so you’ve built, labored, harvested, trained, and explored, and now all your villagers are shagged out. Not having any further villagers to exploit, err… activate… you declare a Pass and play moves to the next player who does the same to her villagers. Advance the Round Marker The round marker is advanced by one, the Cider marker is replaced on the main game board (we’ll get there soon). New villagers are revealed. Remember training (above)? When you Train/buy a new villager from the track of available villagers you don’t replenish the track (until now), so gaps will appear in the list until now. When the track is refilled, any villagers still on the track are slid down to the left (thus decreasing their cost for the next round) and any empty spaces are refilled from the stack of remaining villagers. Rest your villagers. So, after your villagers do things (Labor, Harvest, etc…) they become exhausted, or they may have been injured while Exploring the caves below. Now is when they get better. Probably. Various buildings will provide you with beds. For each bed you have (either Above or Below) one villager can move one step (from Injured to Exhausted, or from Exhausted to Ready). What if I don’t have enough beds? That’s where Cider and Potions come in. Cider will allow you to move one Exhausted Villager to Ready without needing a bed. Potions (found on Adventures or produced/provided by Buildings) allow you to move a Villager from Injured to Exhausted. And yes, you can use a potion to move from Injured to Exhausted and then a Cider to move the same Villager from Exhausted to Ready all in one bookkeeping phase. Same goes for beds. Got an injured villager? Give him a potion and now he’s Exhausted, but if you have an available bed, he can also rest and then move right into Ready all in this round. If you still can’t get all your villagers back to Ready for next round, you choose which ones get to which state (Exhausted or Ready). Collect Income. Gain a number of Coins equal to your income. This starts at 4 Coins/round, but will be increased based on how many goods you have on your Advancement Track. Refresh Goods on Buildings. As mentioned above, some building will produce Goods on an ongoing basis. If you have such a building, and you Harvested all the Goods it contained (i.e., it’s now empty), you now put one of the specified Good back onto it (so it can be Harvested next round. Pass the First Player Card to the Left. Whoever was the first player this round, now passes the First Player Card to the Left and that player goes first in the next round. If you reach bookkeeping and are unable to advance the round marker, do not perform any of the rest of the bookkeeping actions. Instead go straight to Village (victory) point calculation and determine the winner. There’s a lot going on this game, and various paths to victory. You’ll need to balance the availability of your Villagers, with your ability to rest the sufficiently to be able to use them on the next round. You’ll need to look at what buildings are available to be built and what bonuses they grant you. Some are good for harvesting Goods, while others allow you to rest more villagers, others grant you bonuses to use while Exploring, and still others grant you Village points outright (or based on how many villagers/resources/etc… you have at game’s end). I like Above & Below, but don’t play it very often. It takes a little bit to set up (not as much as others, say Firefly or Twilight Imperium, but more than say The Lost Expedition). My biggest gripe with it is that seven rounds seems just a wee too short. I like having a set number of rounds, it limits the game from going on endlessly, but seven often seems abrupt. It seems that you get your engine going right around round 5 or 6, and then only get to exploit it for a round or two at most. That being said, it can lead to some surprise endings as one player suddenly jumps out ahead as the VP leader. As always, my highest recommendation is that I would buy this game, but I already own it, so you decide how I feel about it. I think this is the best of Ryan Laukat, in terms of game play and illustration. I love the art and how the game plays. Ryan did a great job to create an original setting of the universe in this game and it is remarkably full of imaginations. In this game players will lead their villagers to venture deep inside the tunnel into fascinating world of underground in rich story telling aspect that drives the game in such a compelling way to keep players interested, while building their villages into something more advance and getting points to win the game. The core element of the game is that players will explore new places underground which they will be facing a certain encounter from the book of encounter based on their die rolls. The outcome is countless, many combinations of encounters can be found that lined up as a one big story for a player in a single game. I love how the story telling really works in this game, it keeps you engaged within the story, the character and the game. It drives you to make an important decision along the way, which everything has consequences while keeping it simple and easy to resolve. But aside from the story telling, you can still enjoy Euro aspects of the game by building something up and by doing that getting the maximum points you can. I enjoy it very much and this will likely stay in my collection forever. The good thing is if Ryan want to make expansion, he can easily make a new book of encounter with different plots and stories to be included to make new and fresh things. If you can get the KS edition, the wooden resource tokens are way much better than the tiles. Above and Below (A&B) takes place in a generic fantasy world. Players build their village while exploring the caves beneath the village. The theme is fairly well represented in the game. The object of the game is to construct buildings, harvest goods and build reputation to score the most Village Points (VPs). A&B is for 2 to 4 players ages 12 and up and plays in about 1.5 hours. A&B is at its best with 4 players. The components are very good. The Reputation and Player boards are mounted on thick cardboard. There are thick cardboard tokens, wood playing pieces and plastic dice. The large size linen stock cards are durable and have average artwork. The artwork on the boards and cards is a bit cartoonish but colorful and well done. The artwork uses some pastel colors which gives the game a very warm feeling. There is also a wire bound encounter book. The rulebook is only 16 pages, is well written and organized, and has some examples of play. Set-up for A&B is easy but does take a few moments. Each player receives a Player board, three starting Villagers, seven gold and a starting House. The Outpost and Cave decks are shuffled and placed near the Reputation board along with a few other tokens. Place the six star house cards face up near the Reputation board along with four randomly chosen key house cards. Stack the villagers, draw five and place them along with a few starting tokens on the Reputation board. Then select a first player. All set! The player explores the caves. Draw a Cave card, exhaust the desired number of Villagers and roll a D6 for each. A passage from the encounter book is read to determine the fate of the Villagers’ adventure. Exhaust a Villager to construct an available House or Outpost. Exhaust the desired number of Villagers and take one good token per Villager from any of his constructed Houses or Outposts. Exhaust the desired number of Villagers and take one coin per Villager. Exhaust a Villager with a quill symbol and pay the indicated cost to take a Villager from the Reputation Board. Buy a good that has been put up for sale. The price may be negotiated but must be a minimum of 3 coins. Put a good, cider or potion up for sale by placing it in the upper left hand corner of the Player Board. Pay one coin to discard all available House or Outpost cards and redraw. This can be done only once. At the end of the Round players move the round marker, draw new Villagers on the Reputation Board, Rest exhausted Villagers using cider and any available beds, Collect Income, Refresh Goods on constructed buildings and pass the First Player card. The game ends once seven rounds have been completed. Each player then tallies VPs from Goods collected, buildings and Reputation. The player with the most VPs is the winner! A&B is easy to learn and play. Turns play relatively quick with minor downtime. There is also minimal player interaction. There are some interesting mechanics which offer some decision making and a nice storytelling aspect to the game too. A&B can appeal to casual as well as avid gamers. A&B is a game I wanted to like but, unfortunately it did not click with me for a couple of reasons. First, the luck factor is a bit too high for my taste. It can get a bit frustrating watching your opponents reap all kinds of goodies from encounters in the caves while bad things seem to plague every one of your cave encounters. It reminds me of the Peanuts Halloween Special where Charlie Brown is out Trick or Treating with his friends and he watches them repeatedly get some good candy while all he gets is a rock every time. The mechanic for readying exhausted Villagers also leaves a bit to be desired. Exhausted Villagers are readied using a Cider token or one of your available beds. I understand this mechanic is meant to limit the amount of player actions. However, it is tough to come by Houses with a bed and Cider isn’t exactly available in large quantities either. It feels like this mechanic is too limiting. Lastly, the game feels like it ends far too soon. This goes back to the readying Villager mechanic. Seven Rounds seems like a lot. However, keep in mind that if you don’t have many beds or cider your opponents could be doubling your number of actions. You will not be able to accomplish nearly as much as your opponents especially if your cave adventures are folly. It feels like you just start to get going, then the game ends. Despite the points mentioned above, A&B is a light-hearted, easy play which features decent components, minimal downtime and a good storytelling element. Above and Below is a decent game which can be fun, but I suggest giving it a try before you buy. 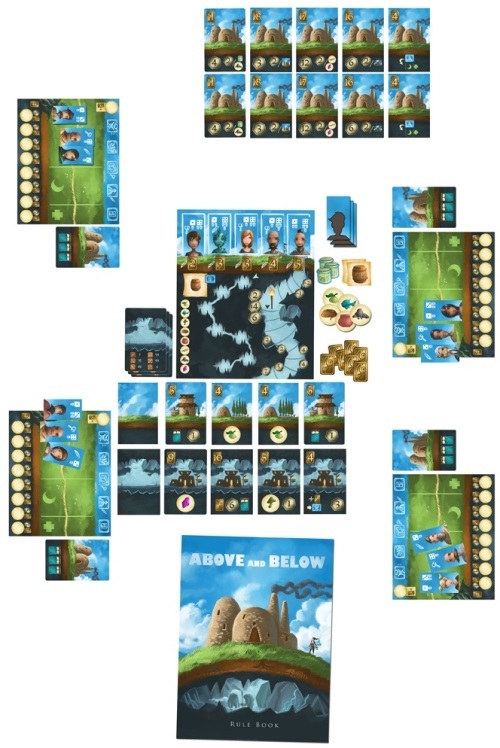 Add a Review for "Above and Below"